MSI reveals its new GT70 and GT60 gaming laptops with Intel HM77 chipset, NVIDIA GeForce GTX 670M graphics, Killer E2200 networking, and Steel Series backlit keyboard. MSI Computer Corp., a leading manufacturer of computer hardware products and solutions, uncages the GT70 and GT60, two mobile gaming beasts featuring Intel© HM77 Chipset, NVIDIA© GeForce© GTX 670M graphics processing unit (GPU), Killer™ E2200 Game Networking, Steel Series backlit keyboard, and more. Designed with the serious gamer in mind, both units provide unmatched power while fortifying MSI's arsenal of award-winning G Series family of gaming notebooks. Bringing a new standard to mobile gaming, the GT70 comes with 17.3-inches of Full HD anti-reflective display to maximize visual experience under all lighting conditions, Steel Series full color backlit programmable keyboard with 1000 customizable color combinations, amplified gold plated audio connections for crisper sounds, 12 GB of DDR3 for superb speed, and more. For gamers looking for even more power, the GT70 is also available with 16 GB of DDR3, BD Burner, and MSI's Super RAID 0 configuration, a unique combination of 128GB (2*64GB) of SSD RAID 0 and 750GB at 7200RPM for unprecedented storage capacity. "Armed with the newest NVIDIA graphics, Intel chipset and Killer Game Networking, the GT70 and GT60 redefine mobile gaming and delivers superior performance that exceeds expectations of even the most demanding gamer," said Andy Tung, vice president of sales, MSI US. 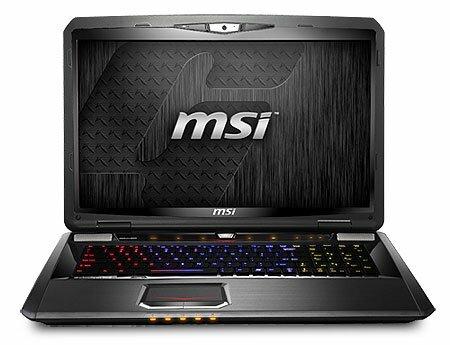 "MSI invites gamers to experience the rush of finding the perfect mobile gaming notebook." All models are protected by a 2 year Manufacturer's Limited Warranty and are available starting at $1499.99 MSRP.